Take Advantage of Our Chaos! This is DAY 2 of our remodeling campaign at Lighting Concepts Showroom, and things are getting crazy around here! 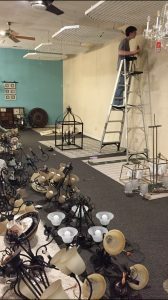 We have fixtures EVERYWHERE, and we are willing to sell them at ridiculous discounts just to help us get everything straightened up! Visit us today to get OUTRAGEOUS DEALS, before we come to our senses!